You have to buy the Villain Pack to earn the ability to include IG-88 in one of your open groups. Though he does cost 12 Threat to deploy and only has 10 Health. On his deployment card you can see his surge abilities are Recover 3 and +2 Damage. He is a bit flexible though as his Aresenal ability gives him a ranged attack, but you can chose any 2 dice you want to roll for the attack. His Assault is also crucial, as it lets you perform multiple attacks during his activation. He also has +2 Accuracy automatically, which makes him potentially punch hard or shoot long. Still it is hard to make a case for him when the rebels can take him out rather easily before he can use much of his shiny toys. Luckily there are still Agenda Cards in his Villain Pack. Sabotaged Plans lets you snipe away an already drawn side mission from under the rebels noses for 2 Influence. This can be invaluable to deny them access to a particular ally (like Luke). With Firepower Upgrade you can boost your droids (and of course IG-88) slightly. Especially on elite Probe Droids, this can be very handy. You could argue that it is overpriced because you need to pay for it each time you want to use it. But since you will be using this in combination with the Technological Superiority class deck anyway, it does have its place. Still, If you play the empire in a campaign, the Royal Guard Champion just brings more to the table. And with Boba Fett showing up in Wave 2, it is hard to make a case for this clanky droid. 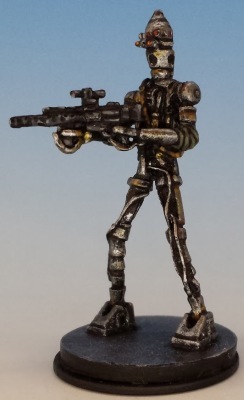 To recruit IG-88 as a Villain for your campaign, you need to win the side mission Binary Revolution, which is included in his Agenda Deck. This mission is playable with just the tiles from the Core Box! He doesn’t fair much better in Skirmish. He is fast with 5 speed and his Assault can hurt quite a lot if he gets close to his targets. But even with his 1 automatic Block he seems to go down so fast. Like with most of the Wave 1 Packs, his Blaze of Glory command card lets you get in an extra activation with him, at least if he can survive that long. With Repair you can also try to give him more survivability. But you sacrifice 2 or most likely even 4 command points (there are 2 Repair cards included in the pack) just for that. Overdrive might have it’s place in Mercenary lists that also run HK Assassin Droids. Giving them an extra 4 mobility for suffering 2 is a clutch move sometimes. Update: With the release of the Jawa Scavanger Villain Pack, players now have access to Focused on the Kill. Costing literally nothing, IG-88 gains 5 Health. But even better are the 2 free movement points each activation as well as the automatic focus for each attack. Attacking with GRR on a range of 3 is certainly devastating. Losing Recover 3 hurts, but IG-88 is much more playable with the attachment than without! The included skirmish map Ord Mantell Junkyard only uses tiles from the core box. He looks the part. Skinny but intimidating, holding a big blaster from the hip. He is one of the easier models to paint, so if you are a beginner, starting with him is probably a good idea. Also his red eyes are very satisfying to see when a painted model is on the board.